Excerpt of article originally published under the title "Turkey: Let Them Die!" 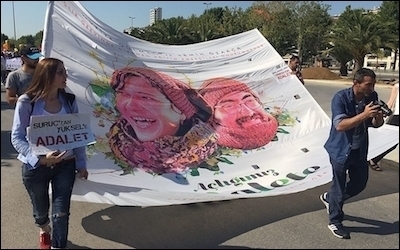 Protesters bearing a picture of hunger-striking teachers Nuriye Gülmen and Semih Özakça during the "Rally for Justice" in Istanbul, July 9, 2017. ... More than 50,000 people have been arrested and some 110,000 others dismissed from government jobs in the country's largest-scale crackdown ever on people with alleged links to terror groups or to the U.S.-based cleric, Fethullah Gülen, whom Turkey accuses of orchestrating the failed coup in July 2016. As cruel as that looks, a case of two Turkish teachers is undeniably worse than just cruel: it displays a remorseless state mechanism. In March, a professor of literature, Nuriye Gülmen, and a primary school teacher, Semih Özakça, both victims of the purge, started protesting by going on a hunger strike: a liquid diet of lemon, saltwater and sugar solutions. Since then, their health has reached critical condition. On May 22, the 76th day of their hunger strike, the police broke down their door and detained them. The reason for their arrest? The police feared "that their protest could turn into death fasts and new protests." At the first hearing on September 15, neither of the "suspected terrorists" was present at the courtroom because the police claimed that if they were brought to court, they could try to escape. After nearly seven months of hunger strike, and their health in critical condition, the idea that "they could try to escape" -- if not a joke -- could only have meant that the Turkish authorities had decided to ridicule themselves. Before the first hearing detention, warrants were issued regarding the 18 lawyers who would defend Gülmen and Özakça. So the hearing proceeded without the suspects or their lawyers present at the hearing. It was a Kafkaesque scene from a NATO member state in the 21st century. Özakça and Gülmen should not be left to the mercy of a remorseless state apparatus. In the earlier days of their hunger strike, Süleyman Soylu, the interior minister, said that the two teachers had lost their jobs because of links to the leftist militant group Revolutionary People's Liberation Party/Front (DHKP-C). "There are organic ties between these two persons and the DHKP-C terrorist organisation... It is very clear," the minister said. The minister's claim was galactically far from the truth. The teachers' lawyer said they had both been acquitted of the charges the minister had mentioned. In 2012, they were acquitted of being members of a militant organization, but in 2017 they were fired from their jobs for having been suspects in a case in which they had been acquitted five years earlier. At the second hearing of their trial on September 28, Özakça was brought to court in a wheelchair, but doctors did not allow Gülmen to be present because of her worsened condition. Özakça said: "Give us back our jobs and we will stop the hunger strike ... The [ruling government] is trying to tame us by taking away our bread." Not even the sky is as vast as the state's remorselessness. At a soccer game in August, a group of fans displayed a placard in support of Özakça and Gülmen. The placard read: "Let Nuriye and Semih live." Just one line -- it was a simple, peaceful wish that the two teachers do not die in jail during their hunger strike. The governor's officials and the law enforcement authorities acted immediately. From security cameras, they identified the persons who displayed the placard and launched a criminal probe against them on charges of "supporting a terror organization." Özakça and Gülmen should not be left to the mercy of a remorseless state apparatus. They must be lent every kind of international support. "Let Nuriye and Semih live!"